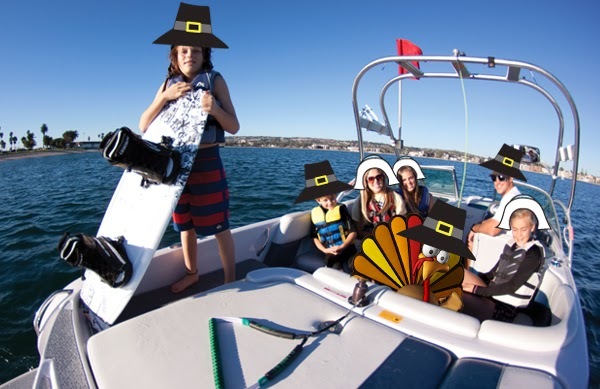 Mission Bay Aquatic Center Blog: Kick-off your Thanksgiving Break with a serving of camp wakeboarding! Kick-off your Thanksgiving Break with a serving of camp wakeboarding! For many years The Watersports Camp has received feedback from campers and parents that they love our spring and summer programs and would like to see similar activities offered throughout the year. We are happy to announce that starting Sunday, November 24 we will be kicking off a series of off-season camp activities with Wakesgiving- a Thanksgiving break wakeboarding event just for kids! The Wakesgiving event, being held on November 24th from 9am-12pm, is a special opportunity for campers to experience the same wakeboarding activities offered during summer... in November! Campers will get to spend a morning wakeboarding, tubing and kneeboarding behind our 2013 Super Air Nautiques with the same great instructors and counselors that they see in summer. The cost of the activity is $69. Spaces are limited so sign up today! Whether or not your kids have been to The Watersports Camp, here’s a chance to put their right (or left) foot forward and jump into wakeboarding and waterskiing. With these off-season camp activities campers will now have the opportunity to experience all the fun that they have during summer, throughout the school year, with new special opportunities to get the whole family involved coming soon! No more waiting a whole year for camp! Campers will now have the opportunity to experience all the fun that they have during summer, throughout the school year, with new special opportunities to get the whole family involved coming soon! Keep an eye out as we continue to develop fun new programs for you to enjoy throughout the year. We can't wait to see you on the water!